I kept a web page (and later, a web log) while preparing and traveling to China in 2003 to adopt Claire. I’ve pieced the entries back to together and removed most of the typos and put it here. Enjoy. A few travel companions joined in contributing to the web log while in China and many people back home left comments, but for the sake of brevity, most of their comments are not included. We submitted our paperwork to China November 2001. The group of single women who submitted their paperwork a few days ahead of us received their referrals a few weeks ago. Sensing the impending news, Chris has broken out the baby bottles, baby spoons and diapers. Oh my it has been awhile since I saw those. As it was the end of the year and I had a few days of vacation to waste, Chris took this rare opportunity to go into work while I watched the girls. I really don’t like to use vacation for the sole purpose of exchanging primary parental duties, but it allowed me to get the call instead of her. 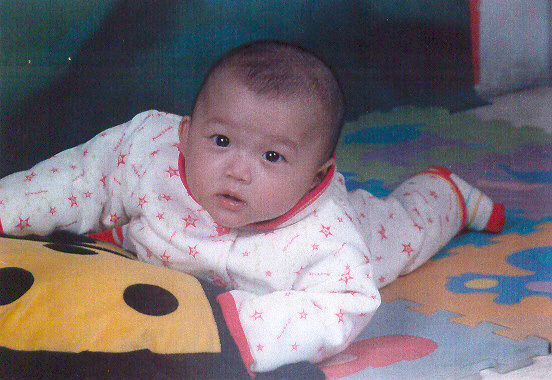 Our agency got a call from the China’s adoption center that our group of five couples had received referrals. No real information though: no names, ages or locations. That information will come in the next few days. We celebrated the anniversary of Katie’s “Gotcha Day” with two other couples who adopted along with us four years ago. One of the couples, the Kuzma’s, will be adopting with us again. It seemed the Kuzma’s and my wife were trying to convince the other couple to adopt again—I believe unsuccessfully. We watched the trip video and reminisced. Chris received an e-mail from our agency guide, Zhou, that we will be adopting from the Chongqing Fuling First Social Welfare Institute. There are large number of adoptions from that area because of the massive Three Gorges Dam that is going in that will flood a large portion of the mountainous region and more than a million people will be displaced. Information keeps trickling in. Her name is Fu Dekang, born on May 7th. Her health status is normal. At five months she was 24 inches long and 13 pounds. It looks like travel is likely to be last few days in February through the first few weeks in March when she is around 10 months old. Fu Dekang, female, was found by a pedestrian at 9:10pm on May 15, 2002 at No.2 Xiangzi Street, Fuling District, and reported to police. The District Patrol Police then sent her to this orphanage at 10:10pm. She was then wearing a colorful winter dress. No notice was found on her body. Fu Dekang was 49cm in height, 3.3kg. 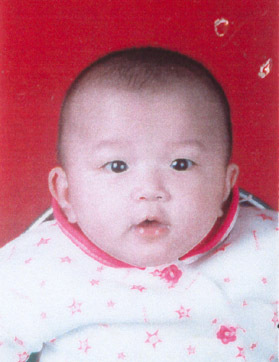 in weight, 33cm in chest, and 34cm in head size when she came to the orphanage. According to her development, we estimated that she was just born for 7-8 days, so we decided that her date of birth should be on May 7, 2002. We named her Fu Dekang. Fu is the first character of the orphanage, also means good fortune, blessing and happiness; De is the virtue of the Chinese nation, also means morals, kindness and favor; Kang is a pretty name, also means health and well-being. During the first week in the orphanage, Fu Dekang’s appetite was normal, she took about 70ml of formula, and slept about 18 hours a day. Through the observation, we found that she is a normal and healthy baby. Fu Dekang since then has been living and raising in a collective way that orphanage provided. Caretakers feed her with formula plus some vitamins. So she is growing healthily. Her head could follow the moving object when she was in 3 months old; she could make a laugh when she was in 4 months. Now her height is 62cm, chest 38cm, head size 39cm and weight 6.3kg. She can sit with some support, she babbles, she can hold a toy and play with her own hand. Her face lighted up when she sees food. There is always a reason for her to cry and laugh. She is a cute baby. Fu Dekang has a routine: she gets up at 7am, noon nap from 11:30 to 1:30pm and another one at 5 to 5:30 pm, she goes bed at 8:30pm. She eats 5-6 times a day with 160ml of formula eat time. She takes first bottle at 6am, then once every 3-4 hours. She poops 2-3 times and pees 6-8 times a day. Fu Dekang has a soft skin, very pretty eyes, and a lovely mouth. She is a quiet, healthy and cute baby. Her shots are updated. Her physical and mental development is normal. We showed the referral picture to our neighbor’s three girls yesterday and told them we had picked a first name but hadn’t decided on a middle name. Within the hour they provided a neatly typed pink computer document listing all the names they would like her to have. In the meantime we changed our minds on the first name. As of 2:59 today she officially will be named: Claire Elizabeth Huffman. Hold your applause until the adoption is finalized. Our guide says we’ll go over to China after the Chinese New Year. This year the New Year is Feb 1, so it looks like we might travel a few weeks earlier than I anticipated. After waiting three days to sign the referral paperwork, my wife pays $23 to overnight the signed packet back our adoption agency. It doesn’t really matter because the agency can’t send all of the paperwork back to China until everyone in the group has returned their signed packets as well. Little bit of trivia: Claire is born in the year of the horse: “If you are born in the Year of the Horse then you are amazingly hard working and very independent. Although you are intelligent and friendly, you can sometimes be a bit selfish. Career-wise you would make a good scientist or poet.” Okay maybe Marissa, with her attitude, was born in the wrong year. I had my wife take several pictures of me in front of a white wall with our digital camera. We need two passport photos and three visa photos in order to travel to China, so I could either have the local camera shop take three pairs of Polaroid pictures of me (for $30) or I could photoshop six 2″x2″ pictures onto one 39 cent 4″x6″ print. Chris doesn’t trust my ingenuity, so she’s still planning on overpaying for her picture. Oh yeah the football team from my alma mater, The Ohio State University, are national champions. Do OSU T-shirts come in a size to fit a 10-month-old? Tonight we scanned the referral photos and printed wallet size pictures on our inkjet printer. Normally we would have the local camera shop print the photos, but the originals are from a color copier and not photo quality. Tomorrow is the first day of the year for my girl’s preschool so we laminated a couple of pictures and gave them to our girls to have and to share with their school-mates. There is a website for parents who have adopted kids from Fuling. It is authored by a dedicated mother. On that site, other pictures of cute little babies, is a list things that the orphanage would find useful. Tonight Chris packed up some treats, mittens, toys and a couple of disposable cameras and will send them off tomorrow with a Chinese translation telling who they are from. I hope it gets there before we do. Chris keeps in touch with many other moms that have adopted from China and Vietnam. She subscribes to several Yahoo! mailing groups and recently added the Chongqing group. Last Thursday afternoon Chris sent me e-mail announcing her final choice for our new daughters name. I agreed. While reviewing the messages on the Chongqing group, it turns out that another mom had chosen the same exact name, Claire Elizabeth, the just the day before. If I were a cynical husband, I might conjecture that my wife is very suggestible. We got a call from our agency Thursday with up-to-date size information for Claire. She is 18 lbs and 27 inches. The biggest of our group of five. She has outgrown her sisters’ hand-me-down infant carrier and Chris is now sifting through 18-month clothes. Chris saw that my 39 cent passport pictures turned out just great and so she requested that I take her picture in front of one of our white walls and do the same for her. I relish the small vindications; they happen so infrequently. We have heard from our adoption agency that we will be traveling February 28 through March 12. We will fly into Beijing and the first few days will be set aside for some sightseeing. I believe we are slated to see a portion of the Great Wall. We plan to take all three of our girls back to Asia when they are around 10 years old so that they can visit and appreciate their country of origin. Evidently you should take your daughter before reaches the rebellious teenage years. Chris FedEx’ed our visa applications along with the passport pictures. We’ll probably fly out of Chicago, over the north pole, to Beijing and fly back through Hong Kong. As I prepared for travel, a good friend offered web space so I could easily update my log while over in China. I have since converted the web log back to what you see here. If there are any family, friends, or co-workers out there actually looking at this web log, I apologize for the long delay between postings. It is quite laborious to hand-end entries on the website from my home machine and I am just now, with the kind loan of CGI-enabled webspace of a friend, converting my blog over to an open source blog tool. The look and feel may change over the next few days. This web tool will allow me to update the blog with much less effort (and theoretically on a more frequent basis). It should also me to post messages while I am over in China from the hotel. We shall see. Like 99% of the children adopted from China, Claire is a female and was abandoned because of it. This illegal abandonment is caused by mixing China’s “one child” rule with a very patriarchal society. We have no idea who her birthparents are. When we adopted Katie from China we explained this sad situation to our 9-year-old neighbor. She understood the meaning of orphan. She took it to heart so much, that she decided she wanted to open her own orphanage when she grew up. Now my wife is attempting to do some paperwork with our county’s children services related to our adoption of Claire. Chris provided a document that proves she has been abandoned and how the governments of the China and US handle the situation, but they keep insisting that she provide a written document from the birthparents relinquishing their parental rights. They insist this even we describe the situation and that no one in the world knows who her birthparents are. (I think leaving a baby in a box on the street is pretty good indication that she isn’t wanted.) Our children’s services are quite snippy about requiring this parental rights document and are digging their heels in. It is sad when a 9-year-old understands something that a woman, who is in charge of insuring the safety other people’s children, is clueless about. When we adopted Katie I bought a mahjongg tile set (which I have yet to learn how to play) and when we adopt Claire, I want to buy a chop for myself. A chop is a ink stamp that has your Chinese name on it that you can use for signing documents. You know, those little square red blotches you see in the corner of Chinese artwork. Chris got one for Katie 4 years ago with the name given to her by the orphanage. I assume she’ll get one for Claire. Well I want one for myself. Well the only thing that is holding me back is choosing my Chinese name. You can either go the phonetic spelling of your English name or pick a real Chinese name. I don’t know Chinese names so I was going to try a real Chinese word. It is hard to pick two words that describe yourself. What two words would you use to summarize your life? I just finished a book, River Town, about a Peace Corp volunteer who spent two years in Fuling which is my new daughter’s home town. Very good book. His American co-worker chose the given name Zhiyuan, which means “Motivated by Lofty Goals.” Evidently some famous poet had that name. I like that. I don’t know how it is pronounced and I don’t what the symbol looks like, but I’m going with it. Now all I need is a last name. Last week, the high school son of one of our friends came over to our house to talk to us about adopting. He had been given the assignment to do a research paper and he, or perhaps his mother, chose to have his research paper done on adoption. He asked how we adopted: we explained it was alot of paperwork and waiting. He asked why we adopted: we explained we wanted to have kids. He asked why we adopted internationally: we explained wanted young children without the baggage of custody hassles common in the US foster system. In the “River Town” book I just read, the Peace Corps volunteer went into the rural Fuling area to spend time with the locals. Near the end of the book, he recalls chatting with a few elderly ladies when a little girl walked up. The ladies indicated that this girl was third child of a couple. Because the parents were peasants the local Communist official could not fine them the customary 10,000 Yuan (about $1200 US). But they could not go unpunished because she was their THIRD child. So instead, the official tore down their house and left the family homeless. Chris said afterward that I shared too much. Our Chinese-speaking babysitter came over Saturday night so my wife and I could go on our last date ever. At least the last date before we have three kids. I had told her earlier that I needed assistance picking a Chinese name for my chop. It seems odd that person should pick his own name and Shiqi (actually goes by her American name Sabrina) seemed to want me to have a different name than Zhiyuan, the one I initially picked for myself. She picked a name that initially made me self conscious. A name too hard to live up to. But… I got over it. So my chop will read Fu Jingyan. The surname, Fu, matches the Chinese name given Claire. This time the father inherits his name from his daughter. Claire was given that name because she was found in the city of Fuling. It also means “good fortune.” My given name, Jingyan, means “Esteemed and elegant.” I can live with that even though I still believe she is being quite charitable. Chris just got a book out of the library: Before the Deluge: The Vanishing World of the Yangtze’s Three Gorges by Deirdre Chetham. It talks about the culture in the area where Claire was found and in a few years, much of it will be under water. The massive Three Gorges Dam will raise the water level 350 feet and displace over a million people. Her hometown of Fuling, like like many cities along the river, contains ancient artifacts that will be lost to the rising river. The oldest known engraving along the river is in Fuling and is from the Tang Dynasty (over a thousand years ago). It served as a low-watermark marker to passing boats. It has over 30,000 characters in inscriptions and it has two engraved fish who eyes appear to be open when the water is deep enough for navigation. Because it is extremely hard to relocate these artifacts, only a very small portion will be removed for preservation. Outside of China, critics worldwide see the dam is a social and environmental disaster. To the People’s party is a way to harness electricity and to prevent the seasonal floods that occur downstream. Enough voices of dissention were raised during the planning of the dam, that the Chinese government eventually made it unlawful to speak out against it. So no one does anymore (at least in public). In last Sunday’s paper I read that they are planning on another large public works project. This time they want to re-route rivers from the south of China to the arid northern regions. Evidently it has too be done. More nature will probably be destroyed, more lives will be disrupted. Perhaps they will need to quell the voices of opposition again. We leave tomorrow morning for Beijing, by way of Chicago. Last weekend we had take out Chinese food. My fortune said “Have a good trip.” Cool. March 12: Flight home via Hong Kong and O’Hare. Stay tuned to this web address. If I can snag Internet access from within China (hotel business centers? Internet cafes? ), I will post messages of our travails. The Kuzma’s arrived in the nick of time to board the Columbus to Chicago flight (about 15 minutes after the boarding started). The flight from Chicago to China went north to the Gulf of Boothia then west to Verkhoysomething (In Siberia) then south to Beijing. It was an uneventful flight, although we were half expecting problems with Abby, the four-year-old daughter of the Schaeffer’s, because she had an ear infection and there were several air pressure changes. The Kuzma’s bought and brought a brand new laptop with a DVD drive to entertain their five-year-old Kori during the flight. Unfortunately its battery was fully discharged and they never had the opportunity to buy spaces. Kori was fine anyway. Kori hangs with Zhou, our guide, probably because she has realized that the two of them (being Asian) are the only ones in our group who look like they belong here. Kori, probably because she is so tied, made a brief angry comment that she thought she was in China being replaced with their second child. After a tiring first day, the preschoolers crashed in the hotel with their mothers while everyone else went out walking and shopping in downtown Beijing. Zhou said the haze in the air is fog, but he is being charitable, as it is a fog that never lifts in this dry city and it smells of burnt soot. We all brought bottled drinking water because the tap water in Beijing isn’t potable unless you boil it. Could be due to some of that “fog.” :-) Chris considered buying a fake Rolex for $30. Kenny Kuzma bought a Chairman Mao watch (his hand waves a red book) for $3. We all passed up the “scorpions on a stick” for dinner from several street vendors. Chris bought a few trinkets (more than anyone else) and she insisted on staying at the mall alone while everyone else went back to the hotel. In our hotel lobby when we got back was a large group of French?/Spanish? parents with newly adopted infants. Most held their babies in one arm while a cigarette was at the end of the other. Then Kenny and I did a quick run to McDonalds right before calling it a day. We did touristy things today. We walked a portion of the Great Wall at Badaling. (Do you gentle readers have maps handy? :-) ) The camcorder freaked out briefly but seems to have recovered. On the way back to the entrance, a stranger trapped me and indicated he wanted to take his picture with me. I guess that makes me a celebrity. There were little kiosks near the entrance and we spent time shopping there. It was cold so some of us bought scarves and gloves. All the vendor’s call out “Hello”s to grab our attention. They were quite assertive. A “Hello” is also Chinese slang for an American. When Chris bought a calligraphy set from one of the vendors, the proprietor wouldn’t return change for her large bill until after she spend another ten minutes badgering Chris (unsuccessfully) into buying something else. After the Wall, we visited a cloisonné factory. Very beautiful handiwork. A Friendship Store (department store chain) was adjacent to the factory and we had lunch and shopped there. There were about 2 saleswomen per customer and they would follow us around: sometimes helpful but usually annoying. Ken Kuzma and Robbie (another dad) bought embroidery painting. Beautiful artwork but they are now in a pickle because they are too big to pack with the luggage and it is quite expensive to ship them home. Our last group stop of the day was at the Yong He Gong temple. It is the biggest Tibetan Buddhist Lama Temple in Beijing. They had a live dance routine in the courtyard when we arrived. There are dozens of buildings in the compound, most of them built in 1694. All the ones we went into had large golden Buddas in them. The largest of which was 59 feet tall; so large in fact that they had to erect the building around the statue. It in is the Guinness book of world records. The two preschoolers were asleep during most of the temple tour. I guess they’ll have to surf to YongHeGong.net [broken link] when they get home to see what they missed. After the group retired for the day, Jane, her husband, Kori, Chris and I retraced our Beijing shopping steps of the previous night as darkness fell. Ken took pictures of Squid, beetle, frog shiskabob (spelling?). The women bought more stuff (surprise, surprise). Strangers, not just vendors, would strike up conversations with us to practice their English skills. We went to a toy store to reward Kori for being a good sport. At the end of one of the toy aisles was a “Homo, my friend” toy display under Plexiglas. It was a large silver robot. Kori sensing an opportunity, picked out the largest transformer/robot she could find (see Jane’s previous posting with a picture). She didn’t go for the Homo. Ken Kuzma sensing impending doom searched for a suitcase to transport the robot and his framed painting. After coming back to the hotel, we split up. Ken Kuzma and Kori went to McDonald’s for sustenance again, Chris took a nap, while Jane and I nerded up by transferring her camera’s pictures to her computer and posting a few of them here. We met the mother of our babysitter (Sabrina) and one of the secretaries from her workplace in Beijing. She hasn’t seen her daughter in years. So we shared pictures and gifts. We videotaped a message from her to her daughter and we will courier some items back to Sabrina at home. Another long day. We fly to Chongqing later today. On the morning of the 3rd, we visited Tianamen Square. The temperature was in the 20s with a very stiff breeze. We walked from the Mao’s tomb end of the square to other where the Imperial Palace (a.k.a. Forbidden City) was located. The walled city is one anteroom and courtyard after another. None of the buildings were open to foot traffic but you could peer into the front archways of each of them. After awhile all the buildings looked the same. The bus met us at the other end of long walk and we were then onto the Jiang Nan silk museum. After walking outside in the cold all morning it was good to be inside. Here is an interesting tidbit for your next casual conversation about moths: one cocoon yields a 1000 meter strand. We helped them make a silk comforter, and we saw a young lady making a silk carpet. Three months into it, her carpet was about 9 inches into a 4 foot carpet. She had another nine months to go. But again it was 10% factory and 90% shopping opportunity. There were quilts, ties, shirts, embroidery. The Wakser girls bought two carpets and the salesgirl lit a flame to them to prove it was real silk. Lunch was at the Hard Rock Cafe. In big gold letters was their motto: “no drugs and nuclear weapons allowed.” Shouldn’t that conjunction be “or?” Perhaps you can carry in weapons if you are not under the influence. In Beijing, the National Committee of the Chinese People was opening their annual Political Consultative Conference. It was a holiday (even for those not party to the party party), and the few days of idle industrial complexes were causing the air to clear just as we were leaving the city. At the security station at the airport they had you drink from your carry-on bottles. We had 5 bottles and had to open and drink from them all. Zhou did not want to open and drink from his two wine bottles, so he had to go back and check them. He found the practice understandably annoying. Despite Jane’s best efforts the world’s largest toy robot made it through security intact. Ken was planning on tossing it if it became a burden. The tray table on the plane to Chongqing has the warning “don’t use computer and play computer game when taking-off, landing, or taxiing.” I guess word processing during takeoff is safer. Chongqing is one of China’s most polluted cities, but it is warmer. We went from below freezing to upper 50s. There were beautiful terraced rice paddies along the route to the hotel, but the smog ruined the pictures Chris tried to take. In the evening Zhou fetched some paperwork from the principality, one half each couple met in the hotel’s business center at 9pm and signed documents for the government. Names and addresses on about a half dozen documents we couldn’t read. We all got to look at updated passport photos of our girls. They all have hair now. While Internet access from this hotel’s business center is expensive ($17 per hour), the hotel offers a dial up ISP for $1.50 an hour in the room. It looks like I’ll be overstaying my welcome in the Kuzma’s suite with the laptop. I want to welcome new visitors back home to this web log. These messages are posted in reverse chronological order so you might want to click on the “February” link to get my postings from the beginning of the trip. I don’t know how many people are hitting this site, but I think all the families are plugged in now. Tuesday was gotcha day. After a fine breakfast, were off to the local constabulary. The Chongqing office for Sino-Foreign Adoption was new and nicely furnished. The office was on the second floor and we had to walk through a liquor store to get there. They led us to a private room with lots of new sofas where the girls already were. They were all dressed in nice new heavy yellow and red outfits with matching shoes. Only one of Claire’s shoes fit. In the original referral pictures all our girls pictures were taken in the same white with red outfit and a fake apple in their lap. With a pen, Kori colored in the hair of her little sister’s referral picture a month ago. Looks like her wish came true. Almost all the girls have little colds. We’ve already made her first pediatrician appointment for the Monday following our return. From past history from other adoptive parents, the lab work for most Fuling babies often indicates slight anemia: possibly from the horrible pollution or the giardiasis that is endemic to the area, but aside from runny noses they all seemed healthy. We met the orphanage director and got conflicting directions on how they liked their formula prepared. They also prepared bottles for us on the spot, but aside from Hannah, most were not hungry. They gave us dry formula to take back to the hotel. The local commissioner from the office gave a very nice speech (Zhou translated) about the girls being little ambassadors between our two countries. They took pictures of the families for their records and of course we took lots of pictures and videos ourselves. After about two hours we packed up our things and walked out past the standing “Have a happy life in the future” sign. On the street while waiting for the bus, a liquor store neighbor brought out her child to share and a small crowd gathered. We ended up walking to the bus and got quite a few stares along the street. Westerners are not common in this city in the middle of China. Back at the hotel we were congratulated by the staff. They asked if Claire, who is the biggest baby of the group, was a boy. We all settled into our rooms we changed them out of their very warm outfits. I’m sure they were all sweating like Claire was. After half a day, her diaper was full. Claire did not like to be changed. They were wearing split pants underneath their coats. Children do not wear diapers in China; instead they go around (even outside) in crotch-less pants with no underwear so they can just squat and go anywhere. Claire does not like to be put down. She will cry unless she is in either mommy or daddy’s arms. Chris was the primary caregiver while I posted yesterday’s pictures. I became the primary caregiver when she, along with half of each couple, went grocery shopping for more diapers and formula. Chris reports the locals weren’t as friendly as earlier. Zhou asked to borrow our airline tickets to Guangzhou. He needs proof that we need the children’s passports in short order. Normally it takes a week to get passports, but we need them in two days for identification at the airport. You know, each time we do this (this is our third adoption) the process seems to get smoother. With many attempts, Chris finally figured out how to calm Claire when in the crib alone. Her bed is an inch think wood lattice frame covered with a blanket folded over for padding. It is a tad softer than our bed. My wife and new daughter are sleeping sounder than I am (it is 4am as I type in bed). As it is overdue, I probably should be introducing the cast of characters on this trip. In addition the Zhou, our guide and the Kuzma’s which I’ve been talking about all along, there are the Ed, Linnette and toddler Abby Schaeffer adopting Lara. Robby Blanton from Georgia adopting Hannah. A good friend Lynn is along because his wife Donna is at home with their 4 month old. Melanie Wakser is adopting Emma along with her mother Carole because her husband Scott is at home in Canton with their 9, 7, 5 and 3 year-old sons. With Wednesday being the first full day with the girls, Zhou planned for it to be a day without any group trips. He did however give some of us a brief walking tour the surrounding blocks for some necessities. The Waksers, Kuzmas and we had mailed disposable cameras to the orphanage after getting the referral. They had been returned to us yesterday and we wanted to have the pictures developed. Robby wanted to go to the photo shop too because he was trying to download images off his digital camera, but was having no luck at the hotel business center without the proper Windows driver installed. Unfortunately we all have different flash media formats, and the shop seemed to support all of them except Robby’s relatively new type. Along the route, Zhou showed us the Internet Cafe. The price was right (25 cents an hour) and he and Carole were able to send some messages, but the process of signing up for a terminal was never really explained to us so we’d be lost without him if we ever came back. Robby again had no luck because these Windows 98 machines didn’t have USB ports. Back at the hotel, Claire and I watched a little CNN while Chris went out for some pictures. When the anchor was introducing a story about North Koreans fleeing hardships into China, the screen went blank after about 10 seconds. 2 minutes later the picture came back and they had moved onto the weather. The Chinese were filtering the broadcast just like the Great Firewall of China that blocks access to CNN’s website. Melanie, Chris, and I later went to pick up film with our two babies in Snuggli’s. On the way back we strolled the area. Chris took pictures of the locals and the digital camera, with its LCD viewfinder, was an ice breaker. Along the street are vendors with very small storefronts. On average perhaps 8 feet by 8 feet. Melanie and Chris stopped into a few of them with children’s apparel. A store had little shoes similar to the ones the girls had when adopted so Chris inquired about the price. The saleswoman, sensing a P.T. Barnum moment, offered to sell them to us for 624 Yuan (about $80). When she saw our amazement, she came back with 58 Yuan (about $7). We walked away at that still inflated price. A 22-year-old local art student, who had given herself the English name Sally, struck up a conversation with us as we walked. She wanted to practice her conversational English which was already quite excellent. The English language is compulsory in Chinese universities now. She mentioned our girls surname, Fu, means lucky. We talked about our large Ohio families and China’s one child rule. I shared pictures of our girls and gave her my business card. She accepted it in the Chinese way: she held it in two cupped hands and studied it for a several seconds out of respect. She mentioned the NY times bestseller River Town book I’ve written about in this journal over the last month. It is banned in China, because it is not always complimentary to the country. While circling the block, a few other women stopped us to peek at the girls. Quickly a group formed around us of about a dozen. Soon they were all talking over one another bombarding our young translator with questions. One bystander commented that our baby has her new mother’s light complexion. Within a block of the hotel I found a souvenir: bootleg DVDs. Movies that are still in theatres back in the states are available for $2.50. Melanie and I bought “Chicago” and Chris bought a few more. Telltale signs of a bootleg were sHIFT lOCK sENTENCES and a quote from a critic on the back cover that was negative: “Frankly, you won’t be all that jazzed.” – Stella Papamichael How’s that for enticing you to buy the DVD? One of the other adoptive parents traveled with her own mother. She contribute an entry describing the orphanage. Today we went to the orphanage where the babies came from. There are approximately 200 children in the orphanage. Most of the children were under 1 year and all but one were girls. It was very clean and you could tell the caregivers were very good to the children. They were very happy to see the little ones that we brought back. Emma was very happy to see one of her caregivers and it was the first time she wasn’t anxious to go back to Melanie. She has really bonded with her, and when Mel moves out of her sight she starts to cry. Grandma doesn’t count so much. This trip has been exceptional, we’re tired from the moving around, flying and of course dealing with babies in a hotel room for 3 days. Tomorrow we go to Guangzhou and the legal forms will be submitted to the government. Today the parents got the passports for their babies, Emma’s picture is very cute as I’m sure most of them are. The babies are so precious and so fortunate to be going to good homes. I believe that most of the babies in the orphanage that are under 1 year old will be adopted and almost all will go out of China. The US has the largest percentage of adoptions, but they go all over the western world. Check out the pictures that Ken has posted. Read Carole’s note on the Fuling orphanage as I’m not going to write as much on it as I usually do. It was a moving experience for us all. It was neat and clean, but they are clearly understaffed. The director reported that none of her children are adopted by Chinese parents. They had vinegar steaming in the crib room to cut down on the smell. To keep them active, with the high baby/caregiver ratio, they put them in mobile walkers, the kind that are illegal in the U.S. because they can roll down stairs so easily. In the doorways of each doorway they have a wooden pole to prevent the children from rolling into an adjacent room. One girl gravitated towards my pants leg, just to touch someone else. She smiled when I put out my hand. We put Claire back in her crib one last time for a picture with her caregiver. Chris was hoping for some clothes or other accoutrements of her abandonment, but there were none. They always put an ad in the local paper now just in case the mother or father changed their mind after abandoning her. Chris was hoping for that newspaper clipping, but the director said she didn’t have it. Chris also wanted to visit the abandonment location so she could take pictures and have something to show Claire later, but again the director reported that all the abandonment sites were now underwater (due to the dam). I don’t know if that was an accurate or just convenient answer from her. Chris was understandably upset that she knows so very little of Claire’s past. The 7th, before our flight to Guangzhou, some of us did more shopping (I know that comes as a surprise). Chris got maps of the province for everyone. Many people got more bootleg DVDs, which was right next to the pet shop with the dogs with lavender or yellow dyed ears. Perhaps if they had dyed Claire’s hair purple, someone in China would have adopted her. All the babies have personalities. Claire is the wiggly one. Hannah is the hungry (and biggest) one. Emma is the sleepy one. Roxanne is the fussy one. Lara is the easy going one (kinda like her big sister). We have been drawing stares everywhere we go in Chongqing. Westerners are rare. Only a few of those stares are unkind. One older man was very upset, but I don’t know if that was because his countrymen were abandoning baby girls or that foreigners were adopting them. I am typing this in a tiny Internet cafe (www.henan-ebs.com) in Guangzhou. A Chinese boy being adopted by an American was just wheeled in the room. He is was abandoned because he has a cleft palate. On the way out of Chongqing, we briefly visited the main municipal building. It was a round building in the traditional Chinese architecture. We are accumulating luggage. A few will finally break down and buy big suitcases. The wait at the check-in counter at the Chongqing airport was forever. The ticket agent initially thought we had 10 babies. I might have taken less time to adopt five more than it took to correct the situation. When the boarding for the flight was announced, everyone rushed to the gate. Despite the posted sign, there was no deference to the families traveling with infants. It wasn’t even afforded to Chinese parents with children. Our group was the last to board. Even though no other planes were taking off or landing, the wait on the tarmac was long too. The girls were cranky until the plane took off. Claire, like most of the girls slept to the rumble of the motor. Chris who came down with flu-like symptoms, slept in the unoccupied back of the plane. We are now at the Victory Hotel. There are actually two Victory Hotels near each other. We are in the original (but remodeled) one, not in the newer one we stayed in last time we were here. The note for guests of the hotel room says “no fighting, no drinking, and no distwrling.” Any guesses on that last word? The original hotel has larger rooms, but we have to walk to the other hotel if we want to take advantage of the complimentary breakfast vouchers. While it doesn’t bother the Kuzma’s or me, others were hoping for an American-style breakfast this morning and will probably seek out breakfast at the luxurious White Swan hotel. Right next to the entrance to the hotel, there is a convenience store. I finally found a diet, caffeine-free drink for Chris. Guangzhou is, like last time, quite accessible to foreigners. We don’t get the stares here because every American adopting has to spend the better part of the week in Guangzhou and we are within walking distance of the U.S. consulate. Still feeling down, Chris slept into today while I had breakfast and played single dad when we went for the babies’ visa photos and medical exams. Claire is 19.5 lbs, and 29 inches. It was a madhouse both at the cramped photo shop and the medical center. We stood in three queues at the center. One weighed the girls (it took about a minute), another was a cursory Ears/Nose/Throat check-up (3 minutes), and the last checked the chest with a stethoscope (maybe 8 minutes). Tack on another several minutes waiting in line. I think all the babies were out in 30 minutes, despite a crowd of easily 50 families coming and going in the office. We all left on our own to go back to the hotel when we were done. My stroller broke down right as I was leaving the office. Claire was crying as I struggled to repair it. Strangers were telling me that she, in her fleece coat, sweater, and outfit, was cold in the 60 degree weather and were buttoning the last of her buttons. When I noticed that the strap was broken too, I just picked Claire up (her crying stopped immediately) and dragged the stroller home. So the next 17 years will be downhill from here, right? Yesterday (Sunday), I got a new stroller. Claire still doesn’t like it even though she no longer submarines out of it. Otherwise she smiles easily and frequently and sometime shakes her head back and forth at the same time for happy emphasis. Roxanne is now much calmer having broken in her big sister. The babies are eating steamed eggs which appear to be a cross between scrambled and poached eggs. They are also eating congee (rice gruel). Lara is taking jar baby food. Emma has the Cheerios thing down. Some of us are still adjusting the formula for proper (ahem) bodily functions. More shopping Sunday. yada, yada, yada. There is an ex-patriot American here running a bagel and pizza delivery service. It seems to be the most convenient way of ordering American food. It has become quite a crutch. Our family skipped the Guangzhou museum and the jade market because we were there four years ago. So I stayed in the hotel room watching Claire shred my now two week old Newsweek in her crib as she and Chris went down for a nap. I helped Carole exchange money (which was harder than it should have been). On the way to the bank, some high school advanced English students were asking us questions to practice their English. On the way back to hotel, they stopped us again not realizing they had already stopped us. I guess we all look alike. We have Claire’s chop. It has her orphanage name in Chinese and roman letters as well as her new American name. I finally have my long-eared rabbit chop as well (I was born in the year of the rabbit). The rabbit carving is atop a small block of marble and carved into the oval bottom is my recently chosen Chinese name. The saleslady, initially humored that an adoptive father would choose a Chinese name, did ask me who picked it out for me. She did seem to like the name though (thank you Shiqi). Late Sunday afternoon, We all met Zhou in one of the hotel’s conference rooms to finish the last of the pre-immigration INS paperwork. There are a few new forms but the never-ending I-864 thankfully wasn’t one of them. That form is to prove that you are above 150% of the poverty line. Believe me, you’d be nuts to do this if your income were near that level. As the parents without spouses present are petitioning for a slightly different status than the rest of us, they still had to complete the form. One of the new forms is a checklist of all the other dozen or so pieces of documentation necessary for the INS (birth, abandonment, adoption, etc. certificates) The packet for submission on Monday is about an inch thick for all of us. Zhou has put each in a large plastic folder. Zhou spent Sunday evening double checking all the paperwork. He came by my room because the photocopy that he had of my passport didn’t show my face very well. He ran to get another copy for the government. He is such the righteous dude. Chris, obviously feeling better, went late night shopping with a few others while I put Claire to bed. Monday, my little family went shopping at the foot of the White Swan hotel in the morning. The White Swan is the 5 star hotel that is adjacent to the U.S. Consulate. Very expensive items are for sale in their expansive lobby. It is Adoption Mecca. About half the shops that surround the hotel offer laundry service because the prices at the hotel are pretty steep. In season, a small room at the White Swan runs around $300. My souvenir (other that the chop) is a small Chinese Chess set. It looks to be a cross between checkers and chess that we all know. I saw many people playing it in the farmer’s market over here. Now all I have to do is figure out to play it myself. This will go with the Mahjongg set I bought when we adopted Katie. For the early afternoon, the other Ken and I swapped spouses. I had lunch with Jane, Kori, Roxanne, and Claire at the White Swan, while Chris and Ken went back to the jade market. Evidently Zhou went through the market so quickly that there was no time to shop yesterday. Our appointment with the INS was at 4pm Monday (today). No camera, camcorders, strollers or backpacks were allowed at the consulate. After a security check, they filed about 70 families into a room that would have been crowded for about 20 of them. All of us presented photocopies of the families’ passports to verify our presence. Unlike last time, there was no queuing for an interview. The interview was silly anyway because we had already presented all the requisite information in forms already. A single INS agent got in front of all of us and said he wanted to keep the meeting short and sweet. “Congratulations for making it through the most bureaucratic process in the world.” Chuckles. “Would you all raise your right hands? Do you swear that all the information you have provided is correct?” There was a resounding “YES!” from everyone in response. “Have a safe flight home.” We were done. We relinquished the babies’ passports to Zhou so he can pick up the sealed Visa packets tomorrow. We will courier them over to Chicago and the immigration officers there will open them and hand us the green their green cards. We went to the Hard Rock Cafe to celebrate. Zhou had prearranged 5 high chairs with teddy bears and ballons at each one. According to a law passed by the U.S. Congress a couple of years ago, our daughters are now U.S. citizens, just like they would have been had they been born from their new mothers. Unfortunately the INS still has yet to understand the spirit of that law. The pictures we took of the girls at the photo shop were 3/4 profile which means the INS will brand them permanent residents and put the picture on their green cards. Because they are already citizens, we should have taken straight on headshots and the INS should have given them U.S. Passports. As we left the consulate, we passed the queue of Chinese nationals attempting to get entrance visas. Today’s line had hundreds of people and it wrapped around the building. Jane and I completed the last of our e-mails and postings at 10:50 last night (10 min before the Internet cafe closed). We weren’t the last to leave. The cafe was the size of two of my co-workers cubicles put together. We visited the Yuntai Garden and the White Cloud Mountain and its bird sanctuary in Guangzhou the day before we left. All during our trip strangers would walk up to Abby and touch her unusual curly auburn hair. On this last day it was still annoying for her. On the way home, we left Claire’s toys on the plane that landed in Chicago. While they were cheap trinkets, Chris was disappointed because they had been shipped to her at the orphanage a month before she met us. Zhou went back to China two weeks later with eight more families.